I’m available for entertaining and educational school visits and library chats for any of my books, from preschool through middle-grade, whether for a single class or several grades all at once. While my programs have general themes, they can be crafted to fit the size of the audience and your curricular interests. Resisting Peer Pressure with Leaping Lemmings! (Preschool through Third Grade). This program takes an interactive approach to understanding and resisting peer pressure. Starting with a reading of the picture book Leaping Lemmings!, students enjoy a whirlwind presentation by answering a few questions and then joining a group exercise specifically designed to help them realize the importance of thinking for yourself. 20-30 minutes. Making History Interesting (Fourth through Seventh Grade). This program helps older students understand ways to make their history essays more exciting, invigorating, and accurate. They learn to use appropriate details while crafting polished papers. Fun and informative, this program offers history writing tips from a pro who has both written and edited history books. 30 minutes. Mary Dyer’s Role in U.S. History (Fourth through Seventh Grade). This program offers valuable information on a nearly forgotten civil rights hero. Students find out how Mary Dyer launched the religious freedom movement in America and fought for women’s rights (including the right to vote) as early as the 1633. Includes an overview of Colonial America and the First Amendment. Great for Women’s History Month or International Religious Freedom Day. 30 minutes. Standard author visit (Any grade). Students can find out what an author does, where ideas come from, and all the rest with this informal discussion on a writer’s life. Can include book excerpts and more. A good choice for Skype visits. Length varies. All school visits include a Q&A period if you’d like. 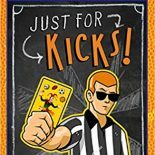 Complete this form to find out more about school visits, library programs, personal appearances, or Skype visits by children’s book author John Briggs! A great visit with the entire first grade!